It was good to meet you on Saturday and many thanks for the effective and innovative way that you showed me around the area, particularly Bertangles and Hamel. By the way, this year is the 93rd anniversary of the Battle of Hamel, perhaps something should be made of this, as of course it is officially recorded that victory was famously attained in just 93 minutes! Keep up the good work and I am happy to refer others in your direction. Admired colleagues and great friends! Your dedication to ensuring that the men who fought on the Western Front will never be forgotten is an inspiration to us all. More power to you both! Peter Pedersen, War Memorial, Canberra. When you dropped my son, Daniel and I in Amiens earlier this month I did not have an opportunity to properly thank you for the battlefield tour that you took us on. Your tour style is great and your knowledge superb. Vic, I may have some details of WW1 but you are absolutely first class in your understanding and knowledge! Both Daniel and I had a terrific time when in your care. Please also thank your wife for the breakfasts she prepared; the omelettes were brilliant! It is my intention to return probably in 2011 with my wife in tow to repeat a battlefield tour but also to use your B&B as a base for local exploration before charging off into the rest of France. Many thanks for a special time. Diane was able to take me to the Battlefield where my Uncle was wounded in action in 1917 and historically outline the events of the battle. This was a very moving experience. Towards the end of our tour we visited the German War Cemetery and appear to have discovered a grave of a distant relation of Barbara’s. I happily recommend Diane and Vic to prospective explorers as their knowledge of the region and the Battles of WW1 is superb. 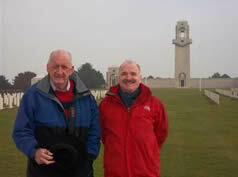 Maz (Marilyn) and I had such a great experience with you on the Somme Battlefields. It was great finding our relative Alfred Miles and paying tribute. Di, you taught me so much about WWI and our stay in your B&B was delightful. I would certainly recommend you to anyone wanting to do a tour of the Somme Battlefields. Thank you. PS. Scott, my partner loved his Iron Cross. It was a WONDERFUL day with Vic , we all enjoyed ourselves very much if that is the correct terminology , as we were absorbed by the whole enormity of the situation and Vic’s obvious passion for his work. Again many thanks. We highly recommend Diane and Vic Piuk to anyone contemplating a battlefield tour. Diane and Vic are an amazing team with an incredible depth of knowledge and remarkable energy and passion. Diane guided our tour of the Somme and her personalised research took us to the precise area in Estrees that saw the action for which Patrick’s great uncle was awarded a VC. By further exploring the area on foot, we were quite overcome by emotion to find the remains of the actual pillbox where it all took place. Our one day battlefield tour was without doubt the highlight of our trip to France. Diane’s enthusiasm and ability to describe WWI history with relevance to the places we visited was completely engaging and inspirational. We plan to return for further tours with Diane and Vic to the areas around Ypres and the Menin Gate. Thanks again for a truly memorable and meaningful experience. return someday with my wife, so hopefully we will meet then. Thank you! Diane, we wanted to thank you again for your wonderful hospitality, knowledge & passion you showed during our tour of the First World War Battlefields. You were an inspiration to both of us & the highlight of our trip. Even though we have experienced so many wonderful things since we left you – Florence is high on our highlight agenda too!! – we still remember your part so clearly. Now that I am reviewing the photographs it is all coming back so much and encourages me to read up & follow up more of your explanations. The friendship you showed us Diane was wonderful, we both feel very close to you like family, even though we shared only 4 days with you. Your care and consideration was greatly appreciated. You made my great uncles into real people referring to Horace and Rupert as if they lived only yesterday. The extra research you carried out & your interpretation of what happened to them really embellished our understanding of their lives and deaths. which are complicated when read in a book seem so much easier to understand. think Andrew is in danger of boring some of his young friends death!). come back again, providing I can get on one of your tours. Endeavours and hope our paths cross again sometime in the future. One good thing we have done since coming home from Europe is to make a book of our tour with Vic of the battlefields, particularly focused on the Pozieres site, and my grandad’s experiences. I wrote and laid it out, while Phyllis bound it into a hard cover at her book-binding class, which has become one of her favourite retirement hobbies. So with that under our arms, we loaded my mum into the car ( she is approaching 97), and drove her up to Mildura in the Riverland (about 400km away) to have a reunion with her only surviving sibling ( 89) who has had poor health. So we had a marvellous couple of days sitting with the two of them going through the materials, and listening to their childhood anecdotes about grandad. Mum was the first born, after he left the army and married my grandmother. So thankyou once again for the large part you played in helping us get in touch with all of this family history. I have attached a photo of the two of them poring over the book we made. Hope you had a happy Christmas and New Year, and are gearing up for an undoubtedly huge 2016. We are back home safely and full of stories for the family. Everybody was fascinated by the information you had acquired…. And to pass this on to our younger generations will be so poignant. Tony and I would like to send our dearest thanks to you, the time and effort you gave us was fantastic…. You made every moment a living page in history. After our visit to Peronne we were sorry that we hadn’t just stayed around the area and enjoyed a few days of relaxation with you. You made us feel very welcome, we enjoyed our breakfasts very much… And the evening in your lovely garden was a real treat. A real highlight to us of course, was the laying of the poppy wreath at the Menin Gate….. A never to be forgotten moment so, so emotional, I felt at that point my dear Mum’s presence so strongly. We cannot thank you enough for using your magic that evening! Well, Diane thank you once again we wouldn’t hesitate in recommending your tours. We wish you continued success with your wonderful business and of course your new venture with your lovely new build…. we both chuckled at the amount of work that you had to do, especially in tackling the garden… But you were just taking it in your stride whilst being so busy . Just wanted to thank you once again…..for all our travel experiences……it was up there as one of the BEST!! !Keith(Cliff) agrees!!!! So job really well done to you! Miller and his brother Leslie Miller 46th Battalion,AIF. We feel privileged to have visited all those sites with you! Our daughter has told me that a four part documentary called The War That Changed Us has just gone to air on the ABC this week,thought you maybe interested? Hope we have the opportunity to catch up sometime! Following our two-day tour of the Ypres salient under your guidance my Regimental Dining Club’s coach party of 44, including many ‘first-timers’, has provided some very good feedback using words like “fantastic”, “excellent”, “a cracker”, “brilliant”, “interesting” and “enjoyable”. Your flexibility, reliability and enthusiasm contributed greatly to the experience. We cannot thank you enough for arranging access to Hussar Farm which allowed us, for the first time, to climb inside the OP on the centenary of its construction by our Regiment. Your never-ending flow of detailed information drawn from an encyclopaedic knowledge of a subject about which you are clearly passionate was quite breath-taking and often difficult to keep up with! Thank you for your contribution to a most successful trip. We wish to thank you very much for everything you have done for us over the past two days. Your work has been appreciated. We have been amazed by your knowledge and interest in WW1 history. Also the extra steps taken to research our soldier and the new information you provided to us has been great. Both days were enjoyable, but today was special for us. You must know that we feel Walter Douglas is at VC Cemetery. It felt much more special there than the other possible places he might have been. Friends of ours who have visited the Somme all said what a sobering, thought provoking place it is, and we have felt that too. So thank you for guiding us around. Thank you very much for giving us such an amazing day exploring the Somme battlefields and cemeteries. You took so much trouble resulting in our seeing and learning so much about our relations, even the places where they made their last stand. Thank you too for researching and sending us the War Diary for Robert’s battalion all of which was very interesting. It was good know that his death was quick as he had already suffered being wounded three times. It is hard to believe what everyone went through during that dreadful war and it has given a lot of food for thought. We had a good trip home – neatly avoiding the rail strike – and hope to meet with you again if we make it out there again. Thank you again for all you did for us – we enjoyed seeing our first ever (as far as we know) appearance on Facebook! Nice memories of a really interesting day. Wanted to let you know that we are both remembering the events of today and watching the TV coverage. We will never forget the Leger “All Quiet on the Western Front” tour we did where you were our battlefield tour expert guide. Your insights, commentaries and knowledge were unforgettable. Thank you. We were thinking about you today. Hope you were able to pay your full part in these commemorations. Just to say how much we enjoyed our stay with you. We had some mixed weather, I know, but still it was truly wonderful. You made us feel so welcome, that coming again in 2017, cannot come soon enough! Bill and judi are very, very close friends, so I suppose that anywhere we go, it is nice and relaxed. However, this was special and we appreciated your kindness very much. So, good health permitting on all fronts, we look forward to seeing you again in 2017. Good morning Diane, Peter and I would like to say thank you for the amazing two days. Those words don’t say enough, we learnt so much and having a connection to the place did make it all the more emotional and we were one of the lucky ones to get him back home. You did above and beyond helping us with our train travel also. Yes we did make all connections which was wonderful, so thank you. Take care and thanks again. I am giving your details to three travel agents that we know well. Faye and I want to thank you most sincerely for the wonder guidance you provided. It was a real pleasure to spend the day with someone who could convey their knowledge with such passion and friendliness, all delivered in your infectious Nottinghamshire voice. We wish your business every success. Best wishes, Gene and Faye Dennis. Thank you so much for such a wonderfully informative day in the Somme on Tuesday. Tony, Jodi, Mick and myself thoroughly enjoyed and appreciated your knowledge Vic and sharing it with us. We talked the train trip back to Paris about what we had seen and your stories. It was lovely to meet you too Diane during lunch and thank you for looking after us.